You are here: Home / Family / Arrr Matey! 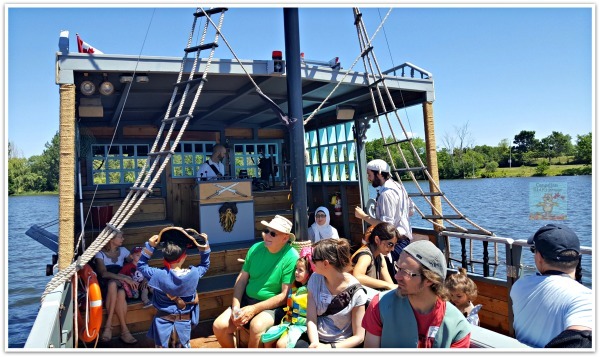 Have You Heard About Ottawa’s Pirate Adventures? 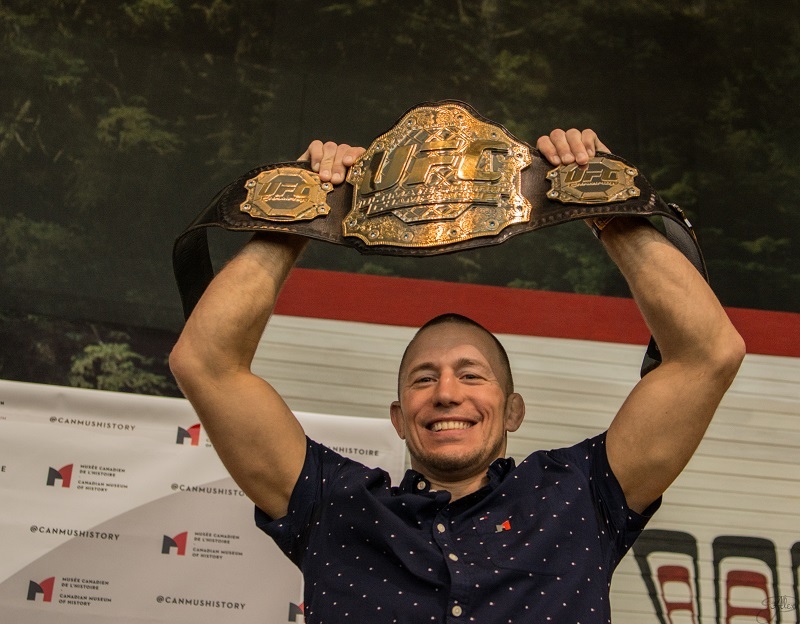 Did you know there are pirates in Ottawa? 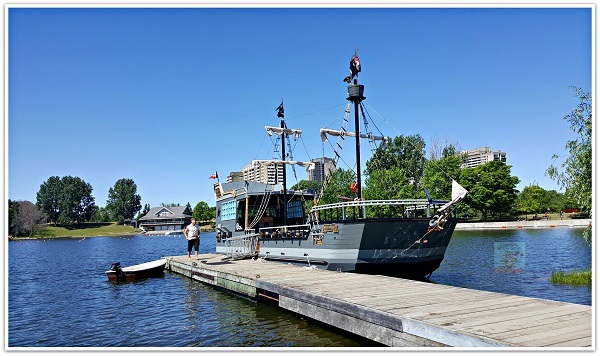 Well, there are, and they are inviting you aboard their Pirate Adventures pirate ship for an adventurous sailing trip around Ottawa’s Mooney’s Bay on the Rideau Canal (a World Heritage Site)! 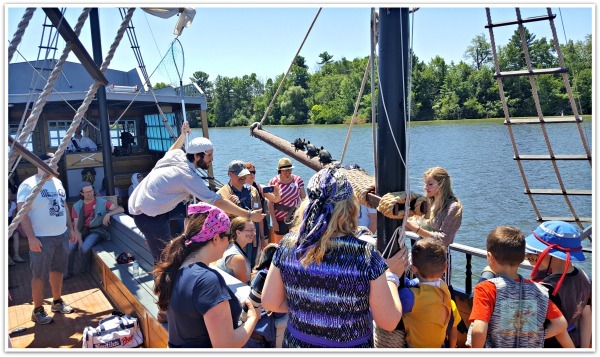 We recently set sail with Pirate Adventures on a hot and sunny July morning. 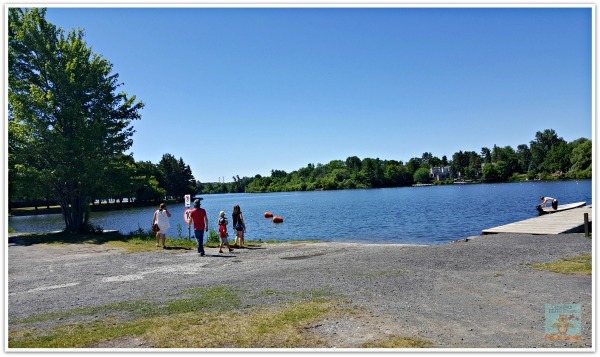 We were in search of a sunken treasure which was “lost at sea” somewhere in Mooney’s Bay. Before our pirate adventure started, we gathered at the office 30 minutes prior to boarding the pirate ship. We were asked to arrive early as this is the time that kids get the chance to be transformed into a pirate – complete with costume and face paint! The giggles, shrieks of delight, and numerous “Arrrs” we heard made it obvious that all the little pirates joining us that morning were super excited to get aboard the ship. The animated crew was extremely professional, well-organized and terrific with the kids. While Pirate Adventures is certainly geared towards kids, this doesn’t stop the crew from trying hard to keep the adults entertained and involved. 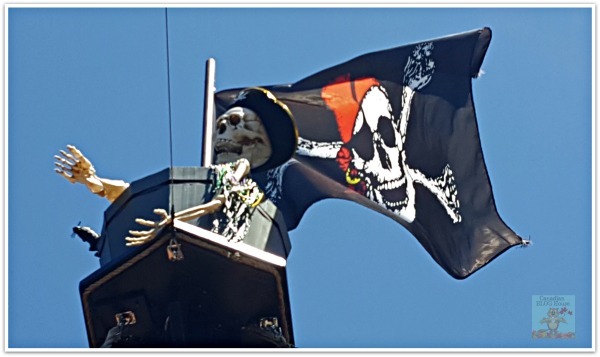 Adults…if you dare board the Pirate Adventures pirate ship…be prepared to participate! Oh and…maybe get just a little wet too! Don’t worry, you won’t get thrown overboard but, you may get splashed. If it is as hot as it was the day we set sail, you won’t mind one bit! It’s all part of the fun! 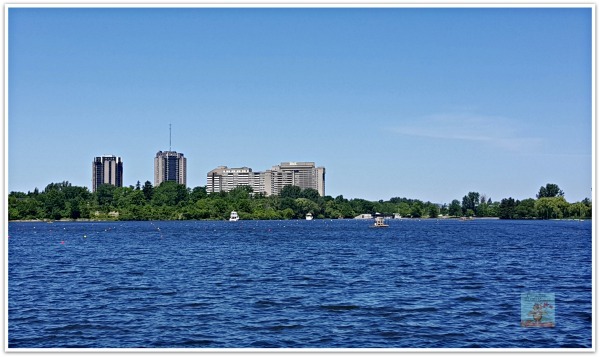 The cruise itself provided me with the unexpected joy of being out on the water and being able to see parts of Ottawa I had never seen before – from that vantage point. Our view included Mooney’s Bay beach, the beach I had enjoyed spending the day at almost 36 years ago when I visited with my sister, her husband, and my nephew – who was only a couple of days old when he visited his first beach. It Gets Hot Out There! 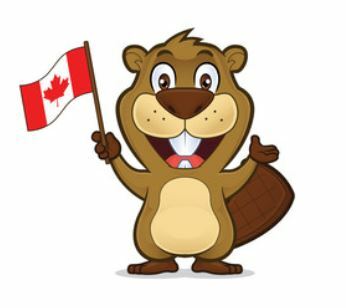 – Be sure to apply sunscreen and wear a hat (if it’s not windy!) if you are sensitive to the sun. Out on the water, you will be basking in full sun – with little chance to escape it unless you are at the back of the boat near the captain. 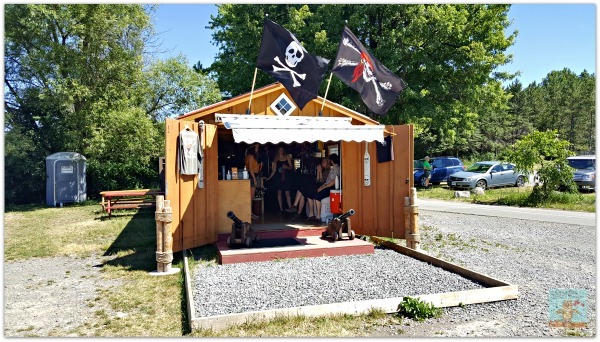 Don’t Skip The Loo – There is no washroom on board the pirate ship so, before you leave dry land, be sure to visit the portable toilet located just behind the Pirate Adventures office. Bring Your Suit – Your bathing suit that is. 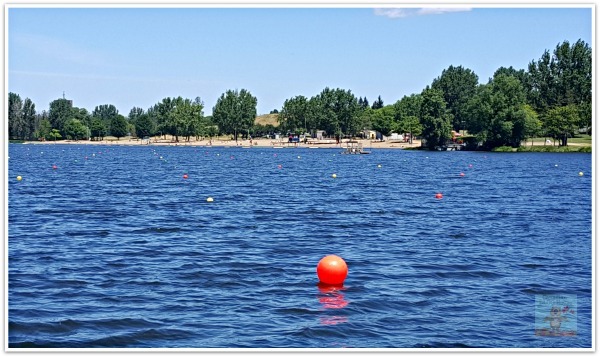 After the fun aboard Pirate Adventures, why not enjoy a swim and some beach time over at nearby Mooney’s Bay Beach. Get Wet! – Don’t worry if you get a little splashed from some of the on board water antics. It’s all part of the fun…and it feels great when it’s hot out! Just be sure to tuck your phone or camera away when not in use to avoid any splashes on your electronic items. 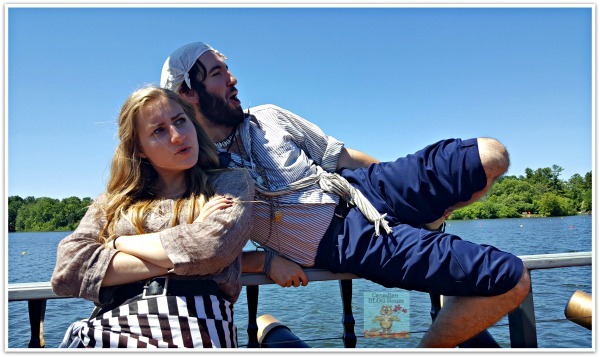 Release Your Inner Pirate – Shiver me timbers! Don’t be afraid to join your kids by donning a pirate hat, a bandana, or whatever pirate clothing is available! Get your best “Arrr’s” ready (you WILL be asked to share yours! 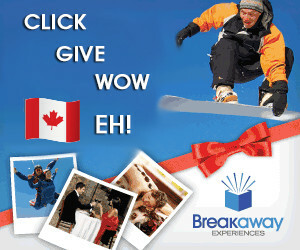 ), and have FUN! P-Arrr-ty Time! – Pirate Adventures offers group bookings for parties, school groups, and more. Hosting your event on this pirate ship could be a whole lot of fun when you’ve got this ship all to yourselves! Definitely a great way to entertain the little ones! 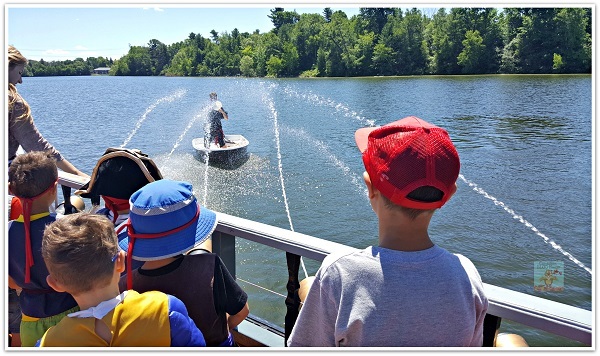 One of the highlights of our pirate adventure was when all the kids got the chance to shoot the water cannons – straight at the nasty pirate who was trying to steal the sunken treasure we had found. The kids gave him a good hard soaking with those water cannons! While Pirate Adventures is targeted towards kids from ages 3-12, we suggest you keep in mind your child’s interests and maturity level when deciding if your child will enjoy Pirate Adventures. X-Man is 10 years old and, unfortunately, he became bored quickly…until the water cannons came to life! It seemed to us that the younger kids (up to about age 8) on the boat that day, had the most fun…and were fully engaged with all the antics and activities. My partner, X-Man, and X-Man’s mother are all bilingual, however, they all found it very distracting that the show was spoken in both English and French (back and forth). While it is very understandable why it is done this way (shows are performed in both languages OR in English OR in French, depending upon the audience booked for a particular sailing), in our opinion, the shows would be more enjoyable if offered in either French or English, not both at the same time. 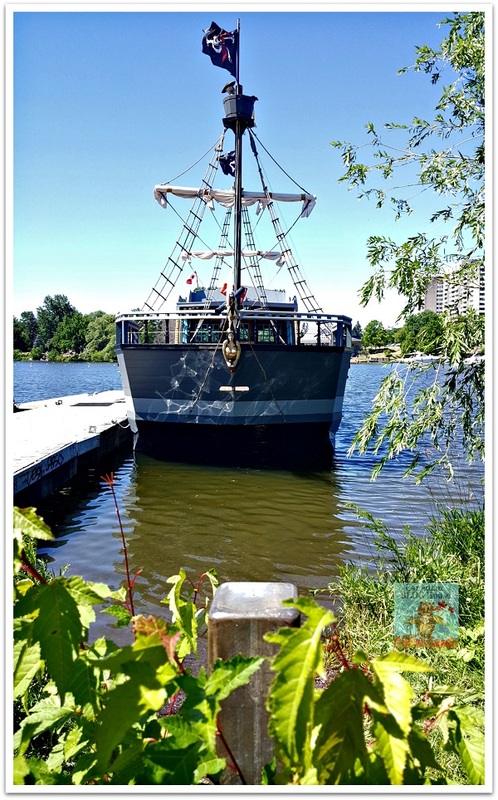 Pirate Adventures is conveniently located just off Hogs Back Road, near Mooney’s Bay Beach. There is plenty of parking on site. 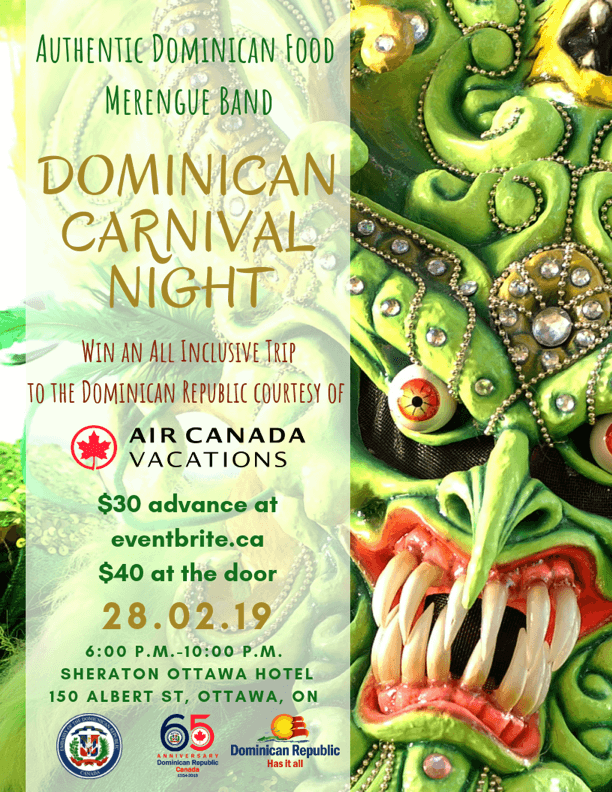 You can find more about their schedule and pricing here. Thanks to the great folks at Pirate Adventures for a fun time out on the water!! 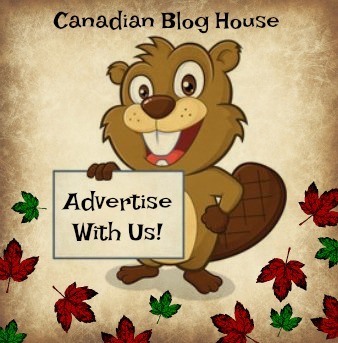 Disclosure: Canadian Blog House received passes in exchange for this review. All opinions are our own. It looks like amazing fun for the younger kids. All my boys were pirate fanatics from ages 6 till 12. 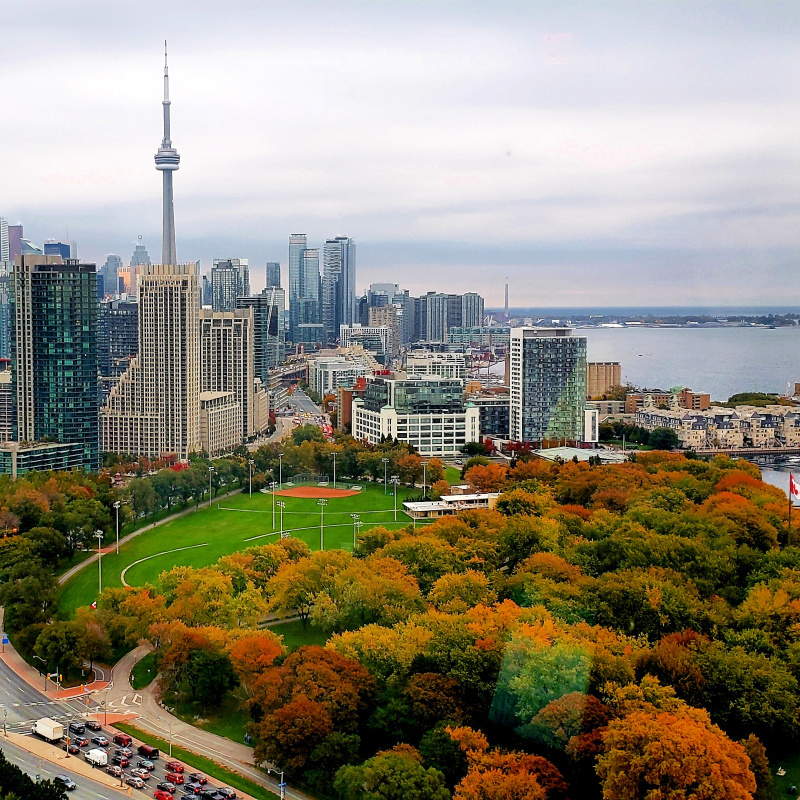 It’s cool to see young entrepreneurs giving young kids and their parents a fun day with some history and great scenery to boot. Ohhh! Your kids would have loved this, Teresa! I agree, it’s such a great idea, and this young staff were really terrific. Their energy and enthusiasm were amazing. I don’t know how they do that show after show! Thanks for stopping by, Teresa! !